Patient Zero, a two-year-old boy dies a few days after falling ill in a village in Guéckédou, a village in southeastern Guinea that borders Sierra Leone and Liberia. A week later, the virus kils the boy’s mother, then his three-year-old sister, then his grandmother. All have symptoms of the virus, including fever, vomiting and diarrhea, but at the time, no one knew what had made them ill. Two mourners at the grandmother’s funeral take the virus home to their village. A health worker carries it to another village, where he dies, as does his doctor. They both infect relatives from other towns. 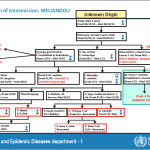 WHO releases the chart of infection in August 2014. Symptoms appear as diarrhea and vomiting, with a very high fever. Some cases showed relatively heavy bleeding. We thought it was Lassa fever or another form of cholera but this disease seems to strike like lightning. We are looking at all possibilities, including Ebola, because bushmeat is consumed in that region and Guinea is in the Ebola belt. 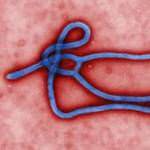 No cases of the highly contagious Ebola fever have ever been recorded in the country. Most of the victims had been in contact with the deceased or had handled the bodies. A total of 75 Ebola cases and 41 deaths are reported. There are 49 cases and 29 deaths in Guinea, eight cases and six deaths in Liberia, 16 cases and five deaths in Sierra Leone, one death in Nigeria and one case in Senegal. A total of 112 suspected Ebola cases and 71 deaths from the virus are reported in West Africa. Guinea’s Health Ministry confirms that the virus has killed 59 people, four of them health workers, and there are 86 cases including three suspected in the capital, Conakry. A total of 248 suspected cases and 148 deaths due to the virus are reported in West Africa. Guinea reports 197 clinical cases, including 122 deaths, with a growing amount in Conakry. Of 24 health workers infected, 13 have died. 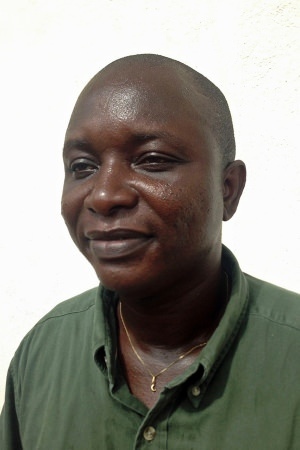 In Sierra Leone, 15 people are under surveillance but no confirmed cases are found. Tests are negative in several deaths in Mali feared to have been caused by the disease. The outbreak appears to have stabilised. 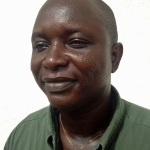 In Guinea, five of the six prefectures where the outbreak occurred have no reported any more cases for almost a month while in Liberia no new cases have been reported since April 9. No confirmed cases are reported in Sierra Leone. Sierra Leone declares a 4-day lockdown from the 18th to the 21st of September 2014. This is in a bid to tackle the Ebola outbreak in the country. The aim of the move is to allow health care workers to isolate new cases and prevent the disease from spreading further. Health workers will be given vaccines in November, after safety checks have been completed. WHO calls for “drastic action” to fight the deadliest Ebola breakout on record and is convening an 11-nation meeting to address the crisis. 635 cases of haemorrhagic fever (most confirmed to be Ebola), including 399 deaths, have been reported across Guinea, Liberia and Sierra Leone, making this the larges breakout ever reported. Doctors Without Borders (MSF) said that the deadly outbreak of the virus is “out of control”. Health workers are prone to the disease because we are the first port of call for those with the disease. Even with the full kit we put on we’re at risk. I’m afraid for my life, because I cherish my life. And if you are afraid then you must take the maximum precautions, stay vigilant and stay on your guard. Brantly receives a blood donation from a 14-year-old Ebola survivor in Liberia while awaiting ZMapp, the first person in the current Ebola outbreak to receive the treatment. What is actually creating the greatest problem is the behavior of the population … It is absolutely something we could expect. The population is being attacked by an absolutely new disease no one [in western Africa] has ever seen before. These individuals will help countries establish emergency operations centers that can develop a structured and effective way of addressing the outbreak. Blood from donors must also be screened for other illnesses such as HIV and malaria before it can be used. We know what to do and can completely isolate them but someone coming home who doesn’t know they are sick and is here a few days and gets sick, that’s the risk. It’s absolutely overwhelming. We are discussing with the F.D.A. the right path to make the drug available to people as quickly and safely as possible. We definitely would like to ramp up to have an impact on the Ebola epidemic. We’re not decision makers on many of these issues. There are regulatory and legal issues that have to be addressed. I have been monitoring (Ebola’s) deadly impact around the clock and I’m deeply saddened at how it has ravaged health workers, families and communities, disrupted normal life and has led to a breakdown of already weak health systems in the three countries. Now we have a real reason to be hopeful. Nigeria declares a State of Emergency after seven cases of Ebola are confirmed in the country after a man arriving from Liberia fell sick. Two of the confirmed cases die while several people who have come into contact with the man are under surveillance. A federal Customs and Border Protection agent says the arrival of a sick passenger believed to be from Liberia last Saturday caused confusion at Newark. The flight arrived at the gate and most passengers were allowed into the customs hall, while the sick passenger was taken to a hospital. For a low-level bomb scare, the plane is parked away from the airport.Airport managers went on the public address system and asked the passengers to separate themselves from people who had been on other flights and were not exposed to the vomiting patient. The San Diego-based Mapp Biopharmaceutical develops ZMapp with the U.S. Army Medical Research Institute of Infectious Diseases (USAMRIID) due to fears Ebola could be used as a bioweapon. ZMapp is made from two serums, MB-003 developed and ZMAb, made by Canadian company Defyrus Inc., and combined by Mapp Biopharmaceutical’s commercial arm LeafBio. MB-003 uses three chimera antibodies developed in mice, with human DNA spliced in, and grown in a genetically engineered indigenous Australian tobacco plant. ZMab was developed in a similar way. Kenya will be closing its borders on Wednesday August 20 to people travelling from Guinea, Sierra Leone and Liberia due to the spread of the virus. Kenya is at high risk as it is a major transport hub. Kenya’s health secretary said Kenyans and medical workers flying in from those states would still be allowed in. Kenyan Airways says it will stop flights to Liberia and Sierra Leone when the ban comes in. Kenyan Health Minister James Macharia said it was “in the interest of public health” and warned that Kenyans and health workers who had returned from the three west African states would face “strict checks” and would be quarantined if necessary. Sierra Leone has voted to pass an amendment to its Health Act whereby people caught hiding Ebola patients could face possible jail time of up to two years. The amendment still needs to go for presidential approval. The country has been hit hard by the current outbreak with at least 392 deaths and 910 cases recorded. [Sierra Leone has suffered] abandonment and isolation from those we viewed to be our biggest friends in the region and beyond. These ugly developments are evidenced in the cancellations of flights, closing of borders, reduction of operational hours of banks and further isolation by shutting down businesses at the time of greatest need. We are very disappointed in the Health Ministry, especially the government that took an oath to defend and protect us; to see them act in such manner is unacceptable and we’ll never allow the government come to bury any longer. They will be resisted by us because I think the government has failed to protect us—why bring Ebola bodies and not bury them well? A laboratory in Sierra Leone is shut down when a health worker is compromised by the Ebola virus. The World Health Organization is concerned the move may hinder efforts to combat the spread of the Ebola virus in the region. Up to this point, Ebola has infected 2,615 and killed a minimum of 1,427 people. It’s a temporary measure to take care of the welfare of our remaining workers. After our assessment, they will return. In light of the analysis of the situation and as requested by the French government, Air France confirms it is maintaining its program of flights to and from Guinea and Nigeria. By isolating the country, it makes it difficult for the UN to do its work. 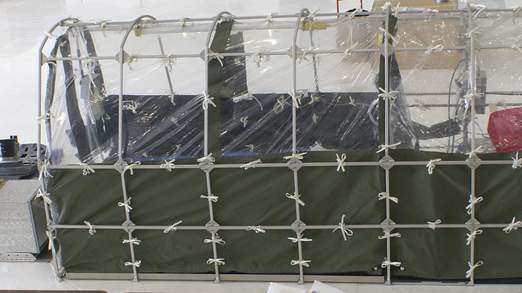 Pilots and others, as well as passengers, generally have very low risk of Ebola infection. We’ve uncovered more than 300 genetic clues about what sets this outbreak apart from previous outbreaks. Although we don’t know whether these differences are related to the severity of the current outbreak, by sharing these data with the research community, we hope to speed up our understanding of this epidemic and support global efforts to contain it. ZMapp is shown to cure 100% of monkeys in a Canadian study. Severe symptoms, rashes, bleeding, excessive liver enzymes and signs of liver failure had a reversal due to ZMapp injections and the monkeys continue to recover from a lethal dose of the virus, even five days after the infection. The anti-Ebola drug has yet to go through the official human testing phase. ZMapp takes several months to manufacture, which is why the dosages are currently not available. While ZMapp has received a lot of attention, it is one of several treatments under development for Ebola, and we still have very limited data on its safety and efficacy. Developing drugs and vaccines to protect against Ebola as a biological threat has been a long-term goal of the U.S. government, and today’s agreement represents an important step forward.